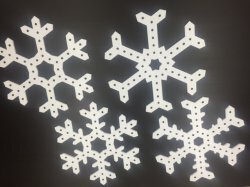 ChromaFlakes are our take on a classic decorating item the Snowflake. 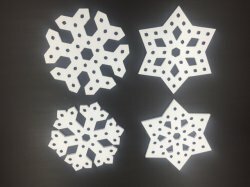 The ChromaFlakes are currently made in 4 designs rather than just one with more designs for future release. Each ChromaFlake is approximately 16″ in diameter and contains 36 node mounting holes. 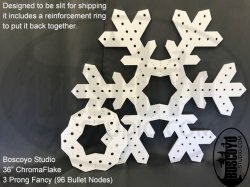 The holes are designed for 12mm Square nodes but bullet style nodes work as well. When using the square node, it will recess into the 10mm coro allowing the LED to be fully exposed on the face of the ChromaFlake while helping reduce the light and wire height on the rear of the ChromaFlake so it can lay flatter to the roof. Custom models of the ChromaFlakes have been added to Xlights to make sequencing a breeze.